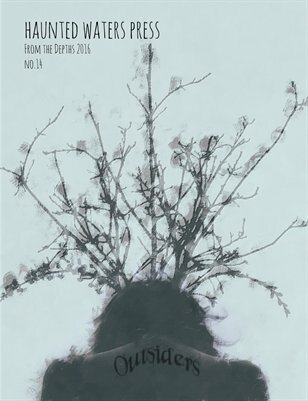 The 2016 From the Depths “Outsiders” edition, inspired by the Grand Prize Winning Entry and Runners Up in the 2016 Haunted Waters Press Fiction & Poetry Open, features works highlighting the unique struggles, circumstances, and journeys that set individuals apart from others. Welcome to the world of Outsiders. Works from W. Royce Adams, Jim Gish, Travis Kennedy, Lauren Triola, Laura Bernstein-Machlay, Sarah Wheeler, Courtney LeBlanc, K. Hales, Misty Burke, Colin Bancroft, William Jablonsky, Monique Hayes, Paul Weidknecht, Sarah E N Kohrs, Sharon Elizabeth Wood, Courtney Harler, Jennifer Jones, Nick Almeida, Richard Chetwynd, Sarah Vernetti, M. E. Wilding, K.L. Cobb, Lee DeAmali, Craig Gist, Jason R. Furtak, Lisa Reily, Janet Stevenson, Bill Teitelbaum, Jennifer Ruth Jackson, Debra Hurst, V.C. McCabe, Adam Barron, Swati Mahapatra, Bryce Worrell, Elane Johnson, Kizzi Roberts, Karen Lettice, Heather MacDonald, Erin O'Shea, J.D. Bretton, Joe Bogle, Brian Beatty, Marie H. Mittmann, and Matthew Vasiliauskas.